BRACKNELL, UK. 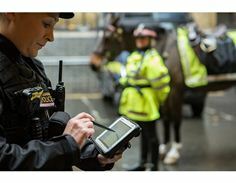 23rd OCTOBER 2017 – When the City of London Police force wanted to deploy mobile technology to help officers spend more time with the public and reduce time-consuming administration and costs it turned to Panasonic and its rugged FZ-M1 Toughpad tablets. After a series of pilot tests with different teams from the police force, the Panasonic Toughpad FZ-M1 tablets were issued to 318 uniformed police officers. Alongside the police radio, the tablets are the primary tool for officers when carrying out their duties. As well as being able to use the touchscreen and stylus to enter information directly onto the device, the officers also have access to USB keyboards when they would like to type extensive reports and a docking cradle to use the devices with a screen when at their desks – reducing the need for desktop PCs at police stations. In particular the City of London Police wanted to deploy the latest mobile technology to cut down on administration and associated costs and to allow officers to spend more time in the community helping the public. When in the community, the device provides real-time access over 4G mobile connection to the force’s primary policing software from Kelvin Connect. This electronic notebook application, called Pronto, enables police officers to access information wherever they are, so that they can provide a better service to the public. It also lets them electronically capture, reuse, manage and submit information from the field, ensuring that high quality information is captured at the frontline and saving time previously spent on paper forms. The fully rugged Panasonic Toughpad FZ-M1 sets the new benchmark for outdoor tablets making it ideal for field workforces in challenging environments. With its capacitive 10-finger multi-touch outdoor display and flexible configurations via an integrated business expansion module, this Windows 10 Pro tablet has been designed to give work forces in the field freedom and efficiency. It benefits from a variety of connectivity options to ensure data is always available when needed and gives users the legacy options they require in a compact, fully rugged and lightweight form factor. Never before has so much flexibility and performance been packed into such a compact, durable tablet with such great outdoor viewing capability.